Rabbi Sherman is the heart of the Temple Etz Rimon community. In addition to leading worship services, she officiates at life-cycle events, teaches adult education classes, directs the Religious School, and provides pastoral counseling to our congregants and families. 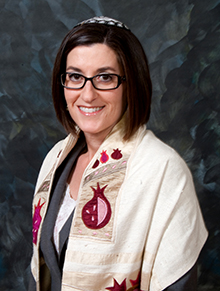 Rabbi Sherman has been serving the congregation since 2009, when she was ordained at Hebrew Union College, Jewish Institute of Religion in Los Angeles. While a student, she served Congregation B’nai Israel in Kokomo, Indiana and Congregation Etz Hayim in Merced, California. Rabbi Sherman also worked as a Rabbinic Intern at Congregation Shir Ha-Ma’a lot in Irvine, California and was a Rabbinic Chaplain in the Spiritual Care Department at UCLA Medical Center. Rabbi Sherman grew up in Orange County and spent her youth as a camper and CIT at Camp Swig in Saratoga. While earning a Bachelor’s Degree in Social Ecology at University of California at Irvine, she worked as the Camp Director and Youth Advisor at her home congregation, Temple Beth Sholom in Santa Ana. She then earned a Masters Degree in Social Work at the University of Southern California. Following graduation, she was the Special Assistant to the CEO and later the Director of Children’s Services at a Los Angeles-based substance abuse treatment center for women. Rabbi Sherman later worked for a nationally recognized, non-profit agency as an advocate and public policy analyst. There she coordinated collaborative projects aimed at improving and integrating substance abuse and child welfare services for children and families across California. Rabbi Sherman is married to Harvey and they have two daughters and a yellow lab named Annie. Rabbi Sherman’s love for Judaism is evident in everything she does. Her wide range of academic knowledge and professional experience is augmented by her love of liturgy, her passion for social justice, her integrity, her compassion, and a true rabbinic heart.